Schedule personal meetings one to one at the Connect MBA event in Washington DC between 5:30pm-9:30pm on November 15th at the Washington Marriott Georgetown. 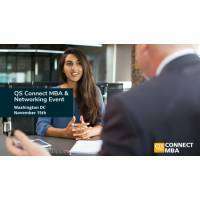 The QS Connect MBA event in DC provides you with a unique opportunity to meet one-on-one and face-to-face with admissions directors from the world's top business schools. Participating schools include; Temple – Fox, Fordham, IE, American – Kogod and many others.